MonsterUp from Karios Games is one of several Doodle Jump clones available for Windows Phone 7. These games are all about climbing as high as possible amid a sea of never-ending platforms. Doodle Jump and its brethren (or is that illegitimate children?) have proven themselves to be addictive thanks to easy controls and gameplay that’s fun in short spurts on the go. 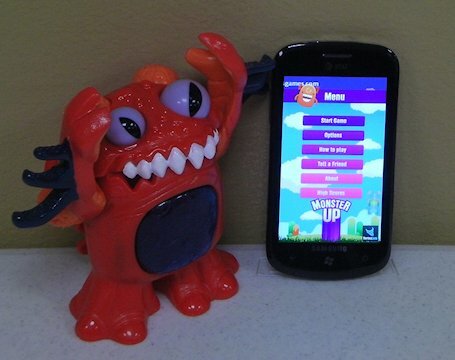 With so many jumping games to choose from, however, MonsterUp needs to be pretty special to stand out from the crowd. Does it succeed? Jump past the break to find out. Players steer an always-jumping monster by tilting their phones left and right. Navigation feels great thanks to precise accelerometer control and smart use of vibration. Challenge comes from the different kinds of platforms that: move, can only be jumped on once, cause players to fall through them, have killer spikes, can’t be jumped through from below, or remain invisible until the player gets close. Small and large springs, boosting, and flying power-ups all launch the player to new heights, though their rewards carry some risk since you may not have time to land safely once they wear off. An invincibility power-up temporarily protects monsters from falls and spikes. 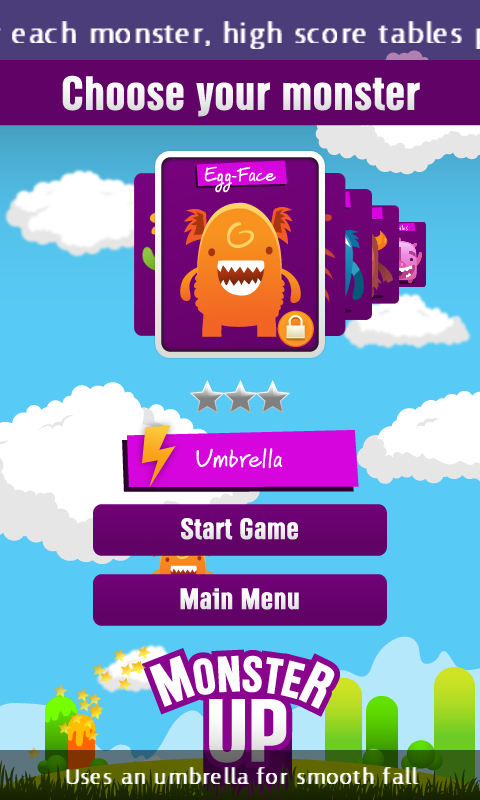 Unlike DoodleJump, MonsterUp doesn’t have any enemies to kill by tapping on the screen. Players never have to tap the screen (except when activating each monster’s special abilities), so they are free to concentrate on navigation, as it should be. The playable monsters and their abilities are this game’s other unique feature. Though only one character (with no special ability) is available from the start, players slowly earn stars that will unlock the next monster. It takes about an hour of playtime to unlock each new monster. Still, their powers (such as a Parachute to slow falls and a Double Jump) add welcome variety to the game play. The first thing gamers will notice about MonsterUp is its charming art style, courtesy of Ilias Sounas. The monster designs in this game are flat and colorful, evoking images of the Foster’s Home for Imaginary Friends cartoon. They look so happy to jump around all over the place, and pitiably sad when they fall. The background art - comprised of hot air balloons and transparent clouds on a dotted sky (and the stars and planets at greater heights) - is bright and distinctive too. I just wish there was more of it. Hopefully future updates bring new environments to climb. March 23 UPDATE: The game now has more environments! Like most mobile games, MonsterUp has only a single music track. Thankfully Kevin MacLeod’s composition matches the game’s whimsical atmosphere perfectly. Any single tune will get old after a while, but I found myself enjoying this one far longer than the songs of other games like Flight Control from developer Firemint. Of course the song can be turned off in the Options menu. The music’s charm is matched by voice samples for each monster. High-pitched and silly, they sound a lot like Team17’s Worms - never a bad thing. Extra touches show that Karios has put some thought into MonsterUp’s presentation. A news ticker on the title screen discusses updates to this game as well as the developer’s titles. It’s unobtrusive and ensures players will know about updates even without visiting the WP7 Marketplace. The How to Play section describes everything someone could need to know to play the game, which is always welcome. Tell a Friend sends an email to anyone on the player’s Contacts list, challenging them to get MonsterUp and beat the player’s current high score. The objective in each game of MonsterUp is to achieve high scores by climbing as high as possible without falling off-screen. Unlocking monsters by playing over time adds another goal. Once all monsters become available, all that’s left is for players to try for a better score. During game play, a line appears on the screen when the player reaches the previous height of his or her high score, much like the finish line in a race. Thankfully, both a local high score table and an online leaderboard track players’ progress. The online leaderboard, dubbed VortexLink, will likely be featured in future Karios games as well. 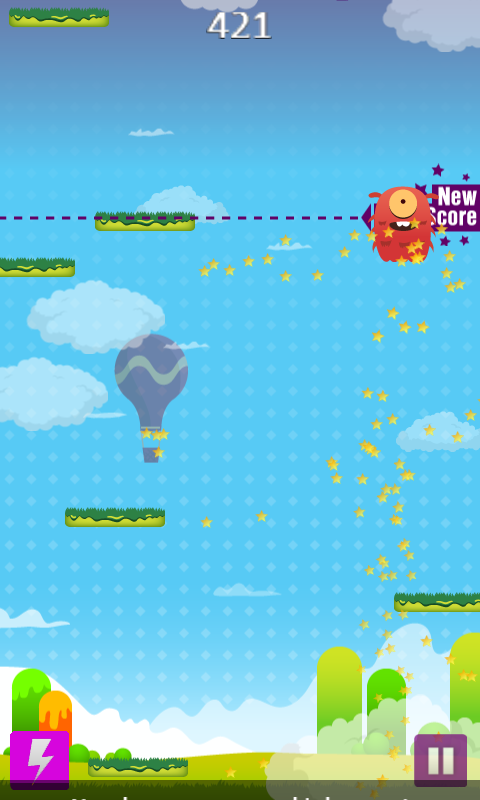 MonsterUp is the best Doodle Jump-inspired game I’ve encountered. It’s simple enough for anyone to play, and its short games are perfect for on-the-go fun. The game could really use more environments, but unlocking new monsters and trying for better scores still keeps it fun for quite a while. The developer has shown great dedication to updating and perfecting MonsterUp so far, so the game’s future looks just as bright as its graphics. I highly recommend MonsterUp to casual game fans and score-hunters alike. MonsterUp can be purchased for a reasonable $1.99. A free trial is also available. Grab it here (opens up a link to your Zune software) in the Marketplace.